I might be one of the few people in the world who would get a "ball of wire" for my birthday and be thrilled. Two new 48 foot soil heating cables for the pumpkin patch. Yea!!! 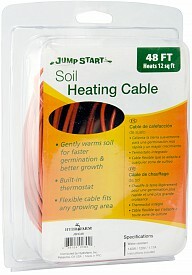 The heating cables will heat the soil which will get the biology going in the soil and promote root growth. This will be helpful in the cooler Midway, Utah climate.